Korean dramas, K-pop and K-films have helped the country successfully promote the Korean language in foreign lands and the global demand to learn the language is growing, Culture Minister Choe Kwang-shik said on Monday. “I think the Korean language is the most important cultural product and our K-pop stars, Korean films and dramas have contributed in increasing the global demand for learning the language. Psy’s ‘Gangnam Style,’ (with Korean lyrics) for instance, directly introduced not only his famous horse dance but our language, life and style to the world,” Choe said at a press conference held to mark his first year in the ministry’s top post. “Hallyu was all about K-pop in the beginning but it led (the global interest) to K-art and now (the interest in Korean culture is shifting) to K-style. Psy, along with other K-pop stars and director Kim Ki-duk, who won the top prize at the Venice Film Festival, will further drive the global interest in Korean culture in general,” he said. Choe was appointed Culture Minister by President Lee Myung-bak last year. The former Korea University professor has been spearheading the promotion of Korean tradition and modern culture through the Korean Wave. 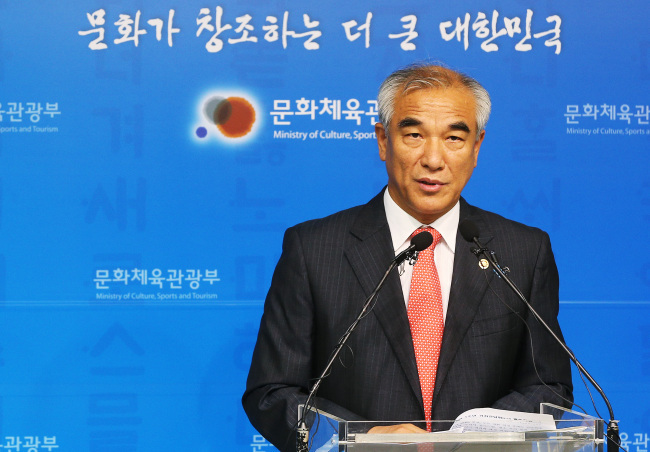 Before taking the ministerial post, he served as director of the Cultural Heritage Administration and the National Museum of Korea. Choe also added that the ministry is pushing to make Hangeul Day a national holiday. “The bill containing the issue of designating Hangeul Day as a holiday has been submitted to the parliament. Lawmakers from both ruling and opposition parties are known to have agreed on the issue,” he added.